With Star City in chaos following the arrival of the villain Damien Darhk, Thea and Laurel interrupt Oliver and Felicity’s new suburban life to ask for help. But Oliver soon discovers that Darhk is no ordinary criminal. In the past, Oliver is caught up in an uncertain mission after an encounter with Amanda Waller. Oliver (Stephen Amell) and Felicity's (Emily Bett Rickards) blissful getaway is cut short when Thea (Willa Holland) and Laurel (Katie Cassidy) pay them a visit and tell Oliver they need his help back in Star City. 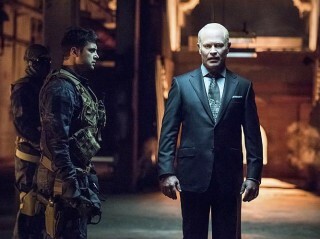 The city has been attacked by "Ghosts," assassins led by a dangerous man named Damien Darhk (guest star Neal McDonough). However, when Oliver returns, Diggle (David Ramsey) makes it very clear that he doesn't want Oliver on the team. Thor Freudenthal directed the episode with story by Greg Berlanti & Beth Schwartz and teleplay by Marc Guggenheim & Wendy Mericle (#401).